Traveling down south is one scenic adventure, but the problem is finding a place to stop when the stomach starts craving for food. Not just food, but food that can be part of the unforgettable journey one is making. Recently, we stumbled into a small restaurant in BF Homes in Parañaque. Not really stumbled, because a friend suggested we stopped by instead of going to the barbecue joint another friend recommended. So, we did, settled down, perused the menu, and decided on three small plates: Chorizo Pasta, Cuban pulled pork sandwich and a cake for dessert. The place has a rather jejune sound to its name, Tito Chef and Everything Culinary. But who cared, we were hungry. And then while waiting for our orders to be put on our table, I became curious who this Tito Chef is? Could he be a chef whose nickname is Tito or an uncle in a family that is a chef? I asked the supervisor who Tito Chef was, and he said, he was in the kitchen busy with something as there was a small party at the upper level of the restaurant. But the waiter could have told the chef someone was interested to meet him. In a couple of minutes he was there at our table. 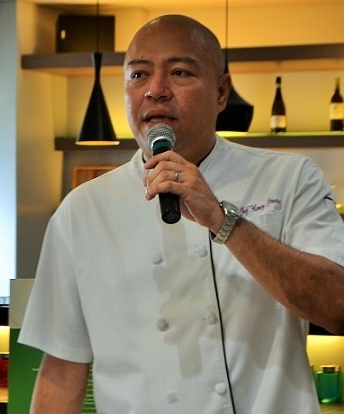 Tito Chef is Menoy Gimenez, an Ilonggo, who said he is happy with his restaurant in the subdivision south of Manila so he hasn’t thought of expanding north or east of where he is right now. Well, he said it with a determination of someone who has made his reputation in the neighborhood and whose restaurant seems to have made quite a reputation residents north and south of BF Homes have been flocking to the restaurant on weekends. So, our verdict on the dishes we ordered ….EXCELLENT! We promise to have a second, third or more visit to Tito Chef and have a taste of the other dishes the menu offered. Soon, I promise. P6.5 opening day gross for "Three Words to Forever"
Do you want to collect steampunk art?